Season 1 wrapped with a shocking finale that saw Warden Sharon Zulu hauled off to jail and Governor Beauty demoted from her treasured position. 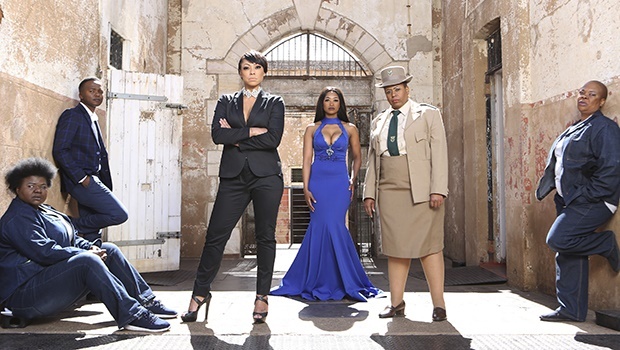 The new season picks up in the aftermath, digging deeper into the characters that make up Thabazimbi Women’s Correctional Service; from the tough-as-nails, Tyson (Lorcia Cooper) to celebrity jailbird Monde (Zola Nombona) and Mazet (Dawn Thandeka King) as they find their feet and fight for survival in the midst of a shake-up that is caused by new arrivals on the scene. Fresh from another prison enters the most dangerous inmate in South Africa, Maki Magwaza who is played by Linda Sebezo. Maki seeks revenge on the woman who took her son away from her and everyone will soon get to see that spilling blood is something that comes naturally to Maki. Another arrival that’s bound to rattle some cages is the stern and focused new top dog, Governor Deborah Banda (Pamela Nomvete) who holds a dark secret that only the walls of prison can handle. Alongside her is Thabo Rametsi, taking on the role of Simon Banda, Deborah’s clueless son. Meanwhile, returning to Thabazimbi after her brief stint as a free woman is Mazet, who is relishing her role as the new boss while Tyson has lost all will to live after suffering a great loss, and Monde occupying herself with protecting her diamonds at all costs. “Lockdown Season 1 explored the world of women behind bars and the challenges they faced as they strived to see another day. Season 2 will show prison life for what it is: layer upon layers of secrets, hopes and pain all shared by those confined behind bars,” says Head of Drama at M-Net, Lufuno Nethengwe. From dark secrets, rivalries, secret plots and an unlikely romance, Thabazimbi will never be the same again. Lockdown Season 2 premieres Monday, 09 October on Mzansi Magic (DStv Channel 161).